All-in-one framework that offers you a simple and quick way to customize Microsoft Internet Explorer with your own browser extensions. It completely supports the Internet Explorer Extensibility API and provides a coherent set of .net components, visual designers and deployment tools that make your IE add-on development and deployment very comfortable. 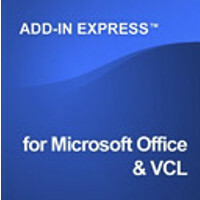 All-in-one framework for developing commercial class Microsoft Office extensions such as Office COM Add-in, Outlook plugin, Excel XLL, UDF, RTD Server and smart tag. It works with all editions of Visual Studio, including Express, and all versions of Microsoft Office from 2000 to Office 2013. Visual designers and components of Add-in Express in combination with a perfect Delphi compiler provide you with the best platform for Office plugin development. Add-in Express makes it equally easy to build toolbars, menus and sub-menus for Microsoft Office 2000 - 2003, customize Office 2013 - 2007 Ribbon using the Office Ribbon designer as well as to create custom static and contextual ribbon tabs, advanced task panes for your add-ins, extend navigation pane and reading pane, Backstage View, Office Menu and Quick Access Toolbar.